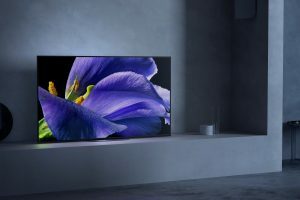 (SINGAPORE, 7 March 2019) – – Sony Electronics Asia Pacific today announced the new A9G 4K OLED television. Sony’s MASTER Series TVs represent the pinnacle of picture quality available to home viewers, capable of displaying images that faithfully convey the creators’ intent. The MASTER Series is the name given to only the very best Sony TVs and provides premium picture quality, colour, contrast, and clarity approaching that of a professional-grade monitor. The MASTER Series TVs also feature Netflix Calibrated Mode to further ensure that content is delivered as intended. The new model features the next generation Picture Processor X1™ Ultimate for accurate detail and contrast. Introduced last fall with the inaugural MASTER Series models, this processor plays a vital role in delivering the high-quality picture in the MASTER Series. The Picture Processor X1 Ultimate has a unique algorithm that can intelligently detect and analyse each object in the picture resulting in exceptional detail and contrast for a more realistic picture that represents the creators’ intent. Premium quality sound is a key part of the viewing experience as well, and the A9G features the new Sound-from-Picture Reality which faithfully reproduces the position of the sound on the screen so when actors are speaking, the sound appears to be coming directly from their mouths and not from a speaker off to the bottom. The A9G is Sony’s new flagship 4K OLED TV available in 77”, 65”, and 55” class, in a very slim form factor. Images come to life with the super-wide viewing angle, precise contrast and absolute blacks of OLED technology. Over 8 million self-illuminating pixels are precisely and individually controlled by Picture Processor X1™ Ultimate. In addition to the processor, the A9G has Pixel Contrast Booster for more colour and contrast in bright areas. As a result, the A9G provides premium picture quality approaching that of a professional-grade monitor, showing images and colours as they truly are, as the creator intended. The processor improves SD and HD content to near 4K HDR quality and shows 4K content in stunning clarity. Acoustic Surface Audio+ provides a totally immersive sound experience with the sound coming from the entire screen, enveloping viewers in exciting new entertainment experiences, providing pictures and sound in perfect harmony. In addition, a TV Centre Speaker Mode provides choice to use the TV as the centre speaker. The A9G is very slim in depth; when wall hung using the SU-WL850 (for other regions) wall mount system, it will fit close to the wall at around half the distance of our previous model[i]. This OLED TV is more than just beautiful. It’s designed so that it appears to be floating on the wall, leaving only the brilliance of its picture. Furthermore, in order to bring the best viewing position and flexible usage, the SU-WL850 (for other regions) has a swivel functionality as preferred. For the ultimate in picture quality, the A9G pairs the brilliance of 4K clarity with the brightness, colour, and detail of High Dynamic Range (HDR). Previously hidden areas of dark shadow and sunlight are now full of clarity and detail. The A9G HDR TVs also feature Netflix Calibrated Mode, and Dolby Vision/ Dolby Atmos to deliver the viewing experience just as the creator intended. The A9G OLED feature Sony‘s Android TV which supports a huge range of apps from Google Play™, including YouTube™, Netflix, Amazon Video and more for deep smart home integration (availability varies by region). And making your TV and home even smarter, the A9G TVs have Google Assistant built-in. These TVs have built-in microphones that will free users’ hands. Viewers can simply talk to the TV using the Google Assistant to find what they quickly want, or to play TV shows, movies, and more. (Google Assistant availability depends on region.) The TVs also work with popular smart speakers such as Sony’s own LF-S50G[ii] and SRS-XB501G2, or those from Google Home or Amazon Echo. With smart speakers, users can control TV and stream content by simply using their voice – with more features to come later this year. Sony Android TVs will be compatible with Apple AirPlay 2 and HomeKit. AirPlay 2 lets you effortlessly stream content from your iPhone, iPad and Mac right to your Sony TV. Watch movies and shows from iTunes and other video apps, and view photos directly on your Sony TV. Play music or listen to podcasts on the television and AirPlay 2 speakers throughout the home – all in sync. HomeKit lets you easily and securely control smart home products using the Home app or by asking Siri on your Apple devices. TVs can be added to the Home app and included in scenes or automations with other HomeKit accessories. For example, users can create a “Movie Night” scene in the Home app to easily turn on their smart TV and dim the lights, and simply ask Siri to launch the scene. AirPlay 2 and HomeKit support will launch in A9G, X95G, X85G models in 2019. For even more user-friendly experience, a new easy to control smart remote enables viewers to control their connected devices such as cable/satellite boxes, Blu-ray disc player, game console (supported devices vary by region) without switching remote controllers. Also added to the smart remote is an RF so users can control the TV without pointing the remote. And a newly developed UI brings seamless and quick access to your favourite apps and settings. Android TV™ lets you explore a world of movies, music, photos, games, search, apps and more. Voice Search to find content, ask questions and control your TV. With Chromecast™ built-in, you can easily send content from your smartphone or tablet to the TV. With access to Google Play™, you can enjoy your favourite movies, TV shows, and games on your TV2. Features X-Reality™ PRO to provide stunning detail with Sony’s unique reality creation database algorithm whether you are viewing a TV broadcasting, DVD, Blu-ray Disc, Internet video service or digital photos. W80G is HDR compatible to receive and process the new video standard signal with higher brightness, higher contrast and more vibrant colours via Internet video services and HDMI[iii]. Sony Electronics (Singapore) was established on 1 October 1999 with business activities comprising sales and marketing, and information systems. As part of Sony Electronics (Singapore), Sony South East Asia is responsible for the marketing and sales of consumer products in Singapore, as well as for business and professional products in Singapore and other countries in the South East Asia region. It also handles export business for consumer products from Singapore to various parts of Asia. Since establishing our presence in Singapore in 1973, we have grown steadily over the years to become a leader in the consumer electronics market. For more information on Sony’s products and services in Singapore, please visit http://www.sony.com.sg/. [iii] Compatibility of HDR is HDR videos of built-in Netflix and YouTube app on TV and all HDR PS4 & PS4 Pro only. HDR image signal specifically means HDR10 Media Profile format (commonly referred to as HDR10). Compatibility with all other HDR content is not guaranteed. For the YouTube HDR service launch for smart TVs, please refer to YouTube Website.